With all the hysteria surrounding the marketing of French Champagnes (and other sparkling wines), we thought we should have a look at some known and relatively unknown labels. Champagne producers all claim, for the most part, to have a three year aging cycle of their wines. With two or three exceptions, this is hard to believe. The quality of the wines was quite good. All bottles had been purchased within the 8 weeks preceding the tasting. 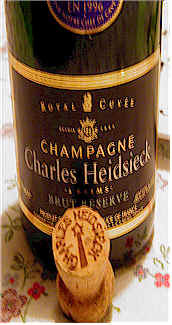 Two wines stood well above the rest on my score sheet: The Charles Heidsieck "Mis en Cave" 1995 (made primarily from the 1994 harvest with about 40% of "reserve wine") was, for those of us who prefer the character of an aged Champagne, the leader. Not only was this wine given a minimal dosage, the wine displayed the toasty, yeasty, bready notes of a well-aged Champagne. I had it as 2.5 stars on the nose and a perfect 3 on the palate. Bollinger's Special Cuvee was similarly styled to the Charles Heidsieck, but just a shade lighter (or perhaps having not so much older reserve wine as part of its blend?). This was also toasty, biscuity and with layers of fine flavors. Also, happily, quite dry (as it should be!). Bruno Paillard, a firm whose Champagne we serve periodically, was perhaps the most effervescent of the bunch. It was mildly yeasty and had hints of toasty notes. The finish proved rather steely and crisp...tangy. Alfred Gratien, a label which recently returned to our market after a long absence, showed evidence of being based on Pinot Noir (and perhaps Meunier, too). It was mildly toasty with a smoky note to its nose. I found it has nice texture in the mouth...rich....dry...tangy and with a long, lingering finish. Unfortunately this is priced about 20% higher than most of the others, so we have little interest in paying for this. Veuve Clicquot finished in 5th place, though a solid last on my scorecard. It was markedly sweeter than the rest of the field of Champagnes. I pegged it as a 1-star quality wine, but wouldn't buy it myself given the level of dosage. The style of Veuve Clicquot has certainly changed over the past decade! Some tasters, however, didn't mind the sweetness. In fact, a couple put this as their top choice. Pommery's Brut Royal was included out of curiosity. I've not been a fan of this firm's Champagne, though I will admit the wine is a shade above "standard." There's a berryish note on the nose and a hint of yeastiness. The wine is a bit fruity in the mouth and crisp, displaying a touch of elegance. Gatinois, a small firm of some reputation in France, was a bit yeasty and toasty. Some tasters were put off by what they perceived as oxidation in the base wine, not the Champagne. I wasn't quite as sensitive to this element. In any case, this is not for the average bear. Ayala was the last place wine. I didn't find fault with this...it's just okay. There's a dusty note to the nose (my glass was clean!) with some hints of toastiness. It has a bit of fruit on the palate and is a decent bottle of bubbly. Nobody had it ranked first or second and but one taster placed it third.